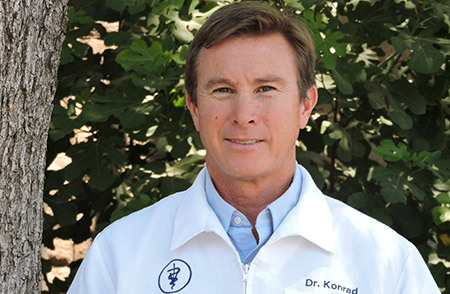 Dr. Konrad moved to the Visalia area from Sonoma County in 1996. He graduated from U.C. Davis School of Veterinary Medicine in 1993 after receiving his Bachelor's of Arts in Biology from U.C. Santa Barbara. He is a member of The American Veterinary Medical Association (AVMA), California Veterinary Medical Association (CVMA), Tulare-Kings Veterinary Medical Association (TKVMA) and the Association of Reptilian and Amphibian Veterinarians (ARAV). His interests include exotic animals, fishing, outdoors, and spending time with family and his many pets.